We live in exciting times. 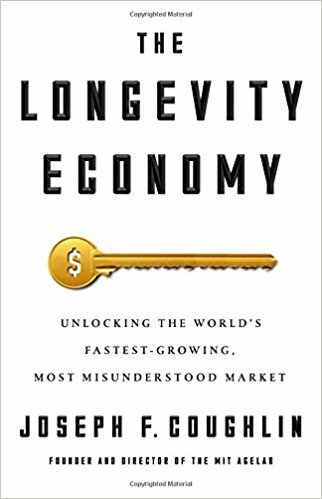 Some of that enthusiasm comes after reading the book The Longevity Economy—Unlocking The World’s Fastest-Growing, Most Misunderstood Market by Joseph F. Coughlin. Why? Even though the book appears to approach the topic from an economics point of view, the vision it paints for the coming years is provocative, uplifting and filled with potential for anyone over 50. 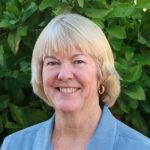 While no one can deny that we all face challenges on a global, national and even personal level depending upon individual circumstances, the cresting wave of baby boomers signals something momentous. The question is: Are we going to ride the surge or just sit on the sidelines? Are we going to create a better future, or just attempt to maintain ourselves until we die? Those are questions for business, governments and every single person alive today. The author, Joseph Coughlin is the founder and director of the Massachusetts Institute of Technology (MIT) AgeLab. He is an author, teacher and thought-leader that focuses on how businesses, government, and cultures respond to aging trends and lifestyles. Not only has he completed hundreds of research publications, he has been named by the Wall Street Journal as one of the “12 pioneers inventing the future of retirement.” Anyone interested in aging well and retiring happy ought to be drawn to his ideas. I know I was. And lest you believe this book is another boring economic book, you would be wrong. He spends the first part of his book uncovering the myths of aging that our world currently holds along with the birth and evolution of retirement as a concept. He goes far beyond merely calling ageism a problem that we must overcome by addressing the mindset in which it was created. He then covers how and why Social Security was designed and its many evolutions to become the institution it is today. Only after exploring the myths about the past does he address the future—and the problems and the potential it surely contains. In the end, he offers many inspiring possibilities for business, individuals, and governments that one can only hope will eventually become more common as we age. A primary theme throughout the book is that our very idea of old age is outdated and needs to be drastically overhauled. Unfortunately, most people seem to view our current thoughts on aging and retirement as something that has always existed and inflexible. 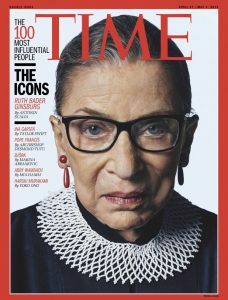 Coughlin however, repeatedly points out that old age is a “socially constructed, historically contingent, and deeply flawed” narrative created out of the last 150 years. In fact, that story has become so prevalent that business, our government and younger generations primarily see getting old as a problem to be avoided at all cost. 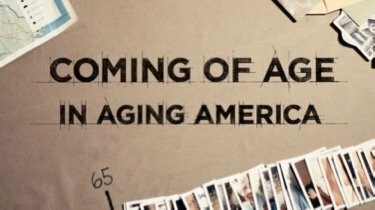 Coughlin clarifies by saying, “it’s a line of thought that can be followed back to the moment at the beginning of the 20th century when society collectively decided that ‘the aged’ was something that required solving. Declaring something a problem is another way of saying that it’s of negative value: that the world would be better off without it.” In other words, society has come to believe that the growing advance of an older population is a “monolithic mass” that is “needy and greedy, always consuming and never producing.” No wonder none of us want to get old! Another unforeseen and often unacknowledged aspect of this challenge has been the “normalization” and later “glamorization” of retirement. Prior to the early 1900s, retirement was considered bad because the only people who retired were either physically unable to work, or forced to quit due to the American obsession with efficiency at all costs. To support those nonworkers, Social Security was gradually introduced to those 75 and over. Not only has that age limit dropped throughout the years to 62, now citizens have the choice to draw benefits even while working. That was never something it was originally designed to do. And yes, people are living far longer than was ever imagined at the time. Those actions helped to engineer the idea that, “retirement” is now “a stage of life” rather than an unfortunate situation. But a downside for calling retirement a “stage of life” is that it continues to reinforce “the idea that older people prefer to be consumers taking support from society, as opposed to producers adding to its strength.” Coughlin goes on to connect how this new stage of life developed as an answer to the “aimlessness of a population learning to define itself in terms of what it bought, not built.” Naturally, business and marketing decided to capitalize on the movement by glamorizing leisure as the ultimate goal for the aged, resulting in a big push for consumerism. Once we arrive at a deeper understanding of how older age has become defined in our culture, Coughlin points out current limitations in terms of new innovation. The majority of businesses are now run by men, young men to be exact, who have little insight into what older people want or need. Even the majority of money to fund new innovation is in the hands of (young) men. Clearly, this current “failure to innovate” shows that in the past “the field of geriatric technology lavishes far more attention on basic needs like health and safety than higher-level needs like the desire for human connection, personal or professional ambition, contemplation, and yes, fun.” Now, with an enormous amount of the world’s financial resources ($5.6 trillion in 2015 alone) held in the hands of those over 50, this enormous (and growing) number of aging population deserves much better attention. Coughlin also shares numerous stories of epic fails in the marketplace. Who can forget the “I’ve fallen and I can’t get up?” Or what about “senior foods?” Does anyone remember those phones with big numbers that could only call home—neither do most other people! As long as products continue to be made and marketed in an outdated stereotypical view of what old means, people won’t buy them regardless of whether they are helpful or not. He says, “When a product is for ‘old people’ and the user, whatever her age, doesn’t think of herself as ‘old’ she’s not going to buy it.” And yes, women control the majority of household spending. 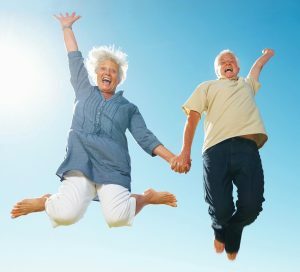 Only those products designed to make life easier, happier and more fun for all ages, including the growing number of older people, will be the most successful in the future. Another provocative section explores the success of retirement communities like The Villages in Florida. Even though 87% of people over 65 say they would prefer to “age in place” in their current homes, destinations like The Villages (or Sun City near where I live), are still very popular among those who retire. Coughlin wonders if that is because they “can seem like the only good, reliable option, simply because it’s the most visible choice.” Remember, most existing houses and those being built today are designed for large families in suburbia, rather than an aging population with different needs. So how can we “age in place” when we live in a house (like a two-story) build in the suburbs where we can’t get around? So if our narrative about old age stays outdated, and without a new agreed on “story” to replace alternative ways of growing older, retirement communities like The Villages can appear “spellbinding.” Coughlin is concerned that senior communities like The Village may continue the old story of aging as needy (people with limitations) and greedy (consumers rather than producers) and further distance future generations and their view of getting older in a positive way. Clearly, Coughlin is positive about aging. He repeatedly cites credible sources that state that most people as they age will likely stay reasonably healthy and active throughout the majority of their remaining years. For example, he reports that “59% of people around the world erroneously think that Alzheimer’s disease, the most prevalent form of dementia, is a normal part of aging—(but) dementia is far less common in old age than the absence of it. Even among those 85 and older, two-thirds of people don’t have dementia.” And while he admits that our mobility diminishes as we age, most of the issues we encounter come from lifestyle designs created for people under 30 rather than the inability of people to continue to manage on their own. Again, the past failure to design and plan for this new demographic is a large reason so many people become mobility-challenged at an advanced age. Okay, how does this apply to your life? Can you “age in place” where you live right now? 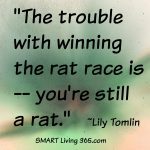 Is your primary goal as you age to “retire” and relax? Or do you see your longer life as an opportunity to find greater fulfillment? Please share your thoughts in the comments below. One of my beefs is the lack of technical outdoor wear in sizes appropriate for midddle-aged people and seniors. I see lots of older people on hiking trails and on the ski hill. Yet unless you are blessed with a body type that mirrors an athletic twenty-something, it is almost impossible to find outdoor wear that fits. The industry is missing a huge slice of the market. I am wearing ski pants that are 25 year-old hand-me-downs. Retired people make an enormous contribution to British society not least as carers (sometimes for their partners, sometimes for their grandchildren) and as volunteers. Our local library and hospital rely on the additional services volunteers provide and without the elderly the funds raised for charities especially through their networks of high street shops would be negligible, meaning that both global and local aid would suffer. 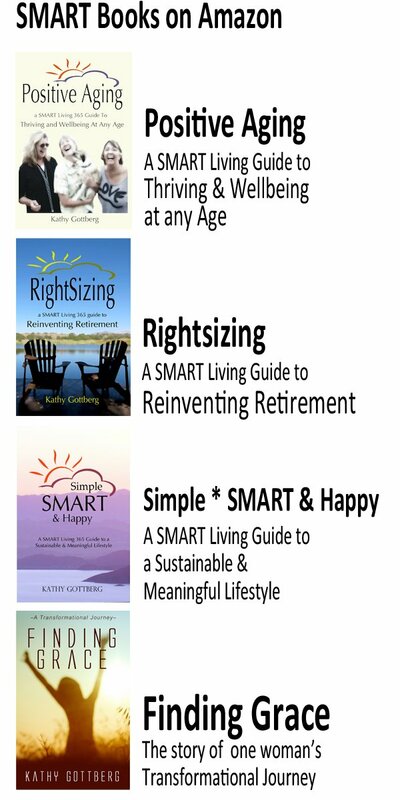 I recognize some concepts covered in your “Positive Aging” book! 🙂 If I ever “retire” I want to just do nothing for the first few weeks and read books and watch TV series, until I am energized again to travel and explore. Ideally, I volunteer with kids and/or animals, learn a couple new languages and try different creative outlets. Can’t wait! Wow, what a fabulous review! I wish I had time to read the book, but my goal for 2018 is to write at least 2 Silver Romances. But thanks for sharing! Must be serendipity—I’ve just posted my article for the week, and it’s (wait for it) about longevity! A different perspective, but it’s a topic people are interested in these days, for sure! The book sounds great, and since I’m interested in the demographics, the history, the possibilities of longevity, I’ll more surely read it! Thanks, Kathy! I blog in the retirement lifestyle space and was literally gobsmacked several months ago when a woman in her 40s commented that it was hard to get support for a blog like mine because older men and women don’t spend much time online and aren’t tech savvy. Just a small anecdote but symptomatic of the lack of understanding of the power (including financial) of the baby boomer demographic. Like you say will the market and governments wake up too late? I hope not. Hi Kathy! I’m 60 and have been retired for 4 years. My husband will be 70 this year. We have an apartment by the beach and currently still live in our home in the city. We chop and change our minds constantly as although we would like to retire and relax our mindset is such that we need more in our lives to stimulate us. 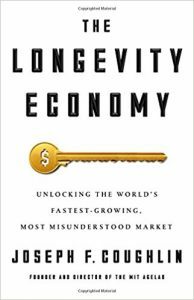 This sounds like a very interesting book and hits the aging myths on the head. The retirement years are so different to our parents generation and most in our age group are living longer so you are right in saying we need to find ways to feel fulfilled. I know I do! Though advances have been made in treatment and interactions with people as they age, a prejudice against older folks still remains. Ironically, as we age we begin to see how we might have contributed to that prejudice, yet by then it’s in a way too late. Knowledge, reading, openness, understanding, all are still needed as we talk to, engage and reach out to folks older than we are. I begins year to year. Interesting information. I guess I’m not surprised that men and women approach retirement with different mindsets (although I must admit – at least now – the five words that I’d choose to describe aging might be closer to the men’s – Retirement. Relax. Good. Hobbies. Travel). We older Americans are definitely a misunderstood, easily-dismissed, under-researched group, which is astonishing considering how large a share of the wealth in this country we are supposed to have. Thanks for the wrap-up of this book … lots of interesting stuff. I certainly agree that women in general plan for retirement better than men do. Maybe it[‘s because women tend to live longer. Maybe it’s because women haven’t focused their entire lives on their careers. Or, maybe it’s because women are better planners! Anyway, we can all learn some valuable lessons from the book and the research. Hi, Kathy – Thank you for another excellent book review. So thought-provoking with lots of gems to mull over. Like Michele, I especially liked the quote “the future will be grey, female, and proud of it.” I found the gender differences for approaching retirement to be fascinating. So interesting Kathy! The Agelab at MIT does research I learned on older drivers when I took the AARP driver’s course. They have contracted by some car manufacturers about seat belt placement and neck mobility issues. One of the results has been the dash back up camera found on some models of new cars. I truly believe we have second and third and fourth acts to our lives if we choose. That is my path for my dotage! Kathy, this is a fantastic book review. I look forward to reading it. I think many of us who blog for this demographic understand the positivity and opportunity this age brings. We aren’t going old and sad and sitting in our rockers waiting to die! I love the quote ““the future will be grey, female, and proud of it.” And we will only be grey if we choose to be! Thanks to informing me about the book. I look forward to reading it! rethinking everything , and your blogs have been helpful in my health journey, which I am happy to say is going well. of your life at least as good, if not better than the previous ones. That’s my plan, and I’m sticking to it.